Special Thanks to Venkat Ratnam P. for his wonderful effort in typing this entire book of Sree Guru Charirta written by Acharya E Bharadwaj. My humble pranams at the DIVINE LOTUS FEET. Today i wish to dedicate a small work to HIM. My father left most precious property for me and let me tell you thats the only thing i have given by him. Swami gave me education and father gave me this book SREE GURU CHARITRA by Acharya E.Bharadwaja. It is a work on compilation of the avatars of Sree Dattatreya. The author had translated this from the original marathi version. This particular book has been my strength and support over the last 7 years since i got in 1997 from my father when i was in my 2nd year graduation. It is a book with 23 chapters and my parents used to do PARAYANAM (read it in equivalent proportions over a period of 7 days from Thursday to Wednesday). I was also asked to do this as the family was undergoing a turbulent financial crisis. I found it difficult to read the book in the beginning, so daddy told me to read one particula para in chapter-9 every day 11 times if i could not complete the book. Being a human, with my monkey-mind, i had been clinging to the book only when i was in the deepest troubles, and soon after i over came the problem, i again neglected the book. But SWAMI is so loving that although i had been an oppurtunist, HE has never left me alone. Always reminding that i have HIM in times of need. Many of you can recollect i had mailed to u all in june about some problems i had been undergoing and even attempted to suicide twice but SWAMI has saved me. I had lost hope at a point of time, but NAMASMARANA and SATSANG on this forum has encouraged me to live on. Above all my dear mother in India has always been praying for me. Now coming to the book, it was on July 2nd, 2004, i had AKHANDA BHAJAIN (i.e, from the evening of 1st july - 2nd july evening). Since i am alone and could not invite anybody else to the bhajain owing to my situation, i had 4 audio casettes of bhajains which i was playing and singing along with music. The evening of 1st July went very well, there was adequate power supply and the whole night was spent well in singing, in the morning there was power cut and i could not sing many bhajains on my own, therefore i decided to stop bhajains and do the parayanam of this book, and thereby read all the 23 chapters during the day. At the time i was reading this book, a thought came to me for the first time, "I must type the entire book and make it available to everybody where all can have access to it as the book is out of print since 1980s. And this book is not available at book centres anymore. This is my GURU DAKSHINA on this holy day to THE ETERNAL GURU"
That night itself after i finished the bhajain and arathi was shown in the evening, i began to work on this without any delay. I completed 18 chapters in 6 days, but then all of a sudden i was unable to sit on the book anymore. Something or the other came up in my way to finish this book. Now i wish to make it available in parts which will make it easy for your reading. 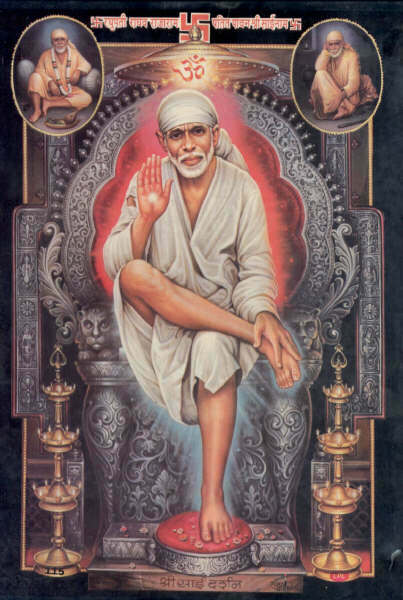 Our Lord SAI is the incarnation of SHIRDI BABA and SHIRDI BABA is an incarnation of LORD DATTATREYA. To illustrate this with a testimony, i wish to recollect an incident which occured in the late 1980s. I was studying at Sri Sathya Sai Vidya Vihar, Ooty. Ooty school was Swami's summer venue. Swami used to visit the school regularly every year in the summer. As per the practice, Swami always haulted for refreshments of the devotees accompanying HIM at the Mudumalai Wild Life Sanctuary on the way from Bangalore to Ooty. During one such trip, Swami stood for a photo session. As he stood there, the cool breeze blew and Swami's robe was not in position owing to the wind. Therefore Mrs.Ratanlal rushed to straighten Swami's robe at his feet, but swami sighed her not to come near HIM. Later when the photo was developed, SWAMI was seen as DATTATREYA standing with a cow behind him. This was later narrated to us children at the school by our Teachers. Many of you visiting Prashanti Nilayam regularly must be knowing Mrs.Ratanlal who is very active in all the activities of the SATHYA SAI ORGANIZATIONS. Therefore today i am mailing the INTRODUCTION of the book in another seperate mail. I thank our beloved LORD to give me this oppurtunity.